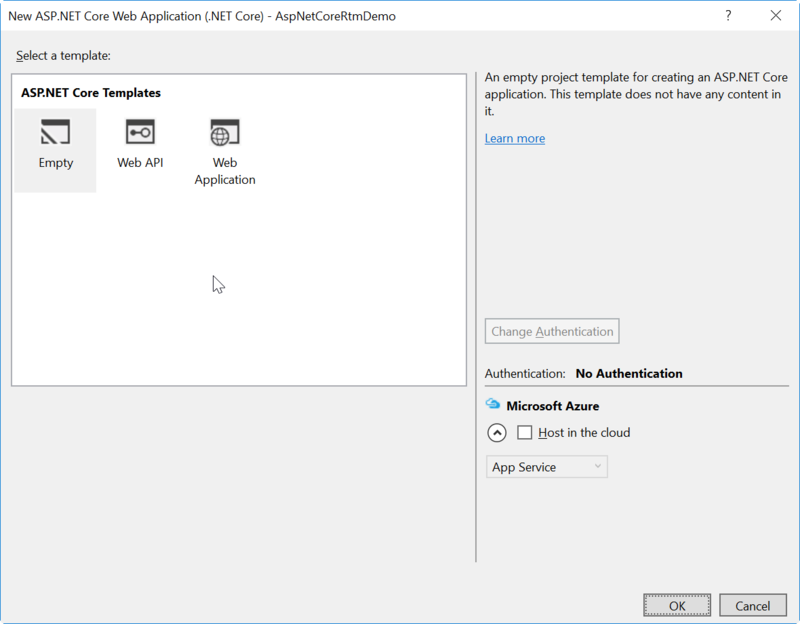 Want to know how you can get started quickly with ASP.NET Core 1.0 and run it on Azure Web Apps? I'll be doing a small series on ASP.NET Core and .NET Core now that 1.0 is out. To create the project, open Visual Studio 2015. 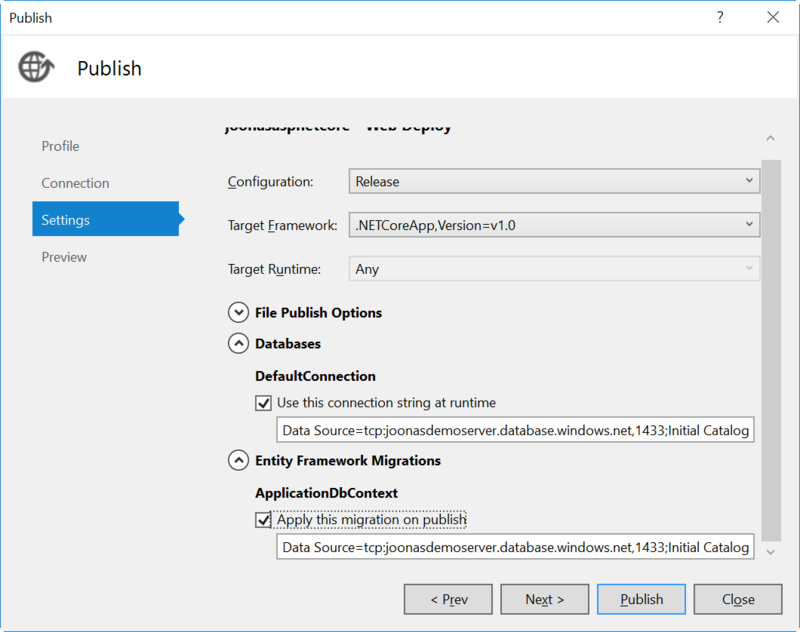 In the New Project dialog select Templates -> Visual C# -> Web -> ASP.NET Core Web Application (.NET Core). Give the project a name and choose its location. Click Create. Empty: Literally empty project. Choose if you want to start from scratch. Web API: Choose if you want to create an API. Web Application: Choose if you want to create a user-facing web application. Note that you can mix API and user-facing application also, they are both in the same framework. Note that you can also choose what kind of authentication you want with the Web API and Web Application options. After the library restore is done, you can start the app through Debug -> Start Debugging. "Is that a button for running the migrations???" Yes it is. Whoever made this error page, you deserve a medal. After clicking that and refreshing the page, everything was working as expected. 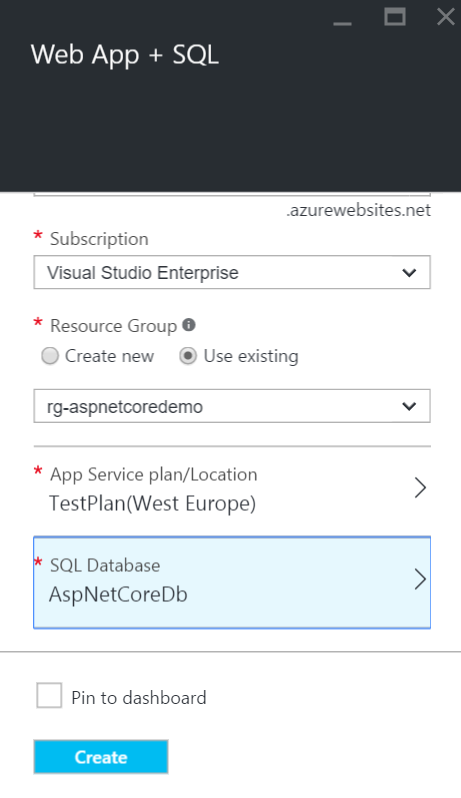 First I created the Web App + Azure SQL Database in Azure Portal. This is quite easy to do with the Web App + Azure SQL Database template. Select Microsoft Azure App Service as target. Log in with your Azure credentials, select the existing app you want to publish to, or create a new one. I chose to change the connection string here because I have not tested how loading the connection strings at runtime from App Service works yet. 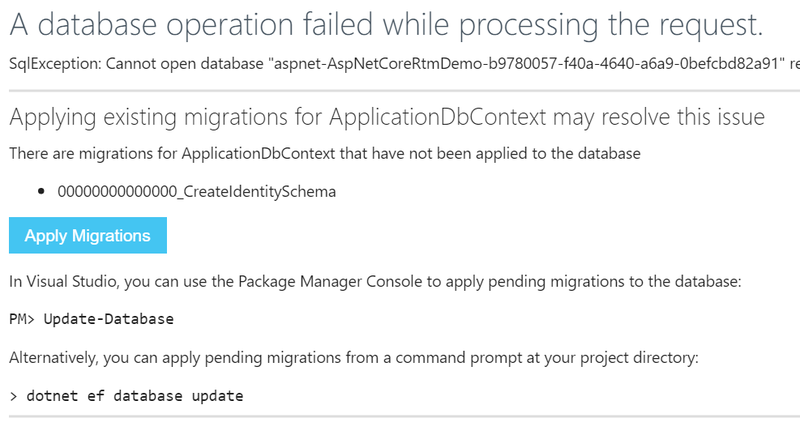 I also chose to run migrations on publish so the database schema is updated in Azure SQL. Check the official documentation for more information.